Annapolis, the state capital of Maryland, was founded in 1649 and served briefly as the Nation’s Capital in 1783. The 1784 Treaty of Paris, which formally ended the American Revolutionary War, was signed in the Old Senate Chambers of the Maryland State House. The historic Maryland State House, built in 1772, is the oldest state capital building in the United States still in legislative use. The Archives Room contains a cross-section model of the State House dome and early photographs showing changes that have been made to the building over time. Maryland’s legislature meets for 90 calendar days each year starting on the second Wednesday in January. The State House is open to the public from 9:00am to 5:00pm Mondays through Fridays and 10:00am to 4:00pm on the weekends. Free walk-in tours of the first floor are usually given at 11:00am and 3:00pm each day. The adjacent Old Treasury building, built between 1735 and 1737, is the oldest public building in Maryland. In 1949, the state restored the building and it is now open to the public for viewing. The City Dock is the heart of historic downtown Annapolis. The adjacent waterside park is the site of summer band concerts. At the head of the dock, a plaque commemorates the 1767 arrival of Kunta Kinte, whose story was told by his descendent Alex Haley, in Roots. The Historic Annapolis Foundation Museum Store and Welcome Center is located at 77 Main Street in an historic building. The Foundation owns the William Paca House and Gardens. The home of William Paca, a signer of the Declaration of Independence and a governor of Maryland during the Revolutionary period and constructed between 1763 and 1765, the house stands today as one of the most impressive of Annapolis’s restored eighteenth-century mansions. The house and gardens are open for tours daily during the spring, summer, and fall, and on the weekends during the off-season. West Street, which connects Church Circle and the Southern Historic District, is becoming a center for art and entertainment in Annapolis. A recent renovation project has added a brick walkway and other aesthetic improvements. This area, known as Inner West Street or the Uptown District offers coffee shops, restaurants and bars, theaters, galleries, and upscale accommodations. The Loews Annapolis Hotel and Westin Anapolis are located in the Inner West Street area. Many of Annapolis’s restaurants, bars, and pubs host live music on a regular basis. One of the most popular is the Ram’s Head, where you’ll find a full line-up of regional and national performers. And the Naval Academy has an active music program that provides free performances for the community. On the first Sunday of each month (Noon to 5:00pm, May through October), West Street hosts the First Sunday Arts Festival. The festival provides a stage for both visual and performing arts. You’ll find live music and vendors selling handmade goods. The United States Naval Academy, in Annapolis, has a visitor center with exhibits, including USNA Graduates in Space and the Freedom 7 space capsule, The Life & Times of John Paul Jones, a Sample Midshipman Room and displays on the life of midshipmen. The Armel-Leftwich Visitor Center’s theater shows the film “Leaders of Character: Leading the Nation.” The Naval Academy Gift Shop also is located here. 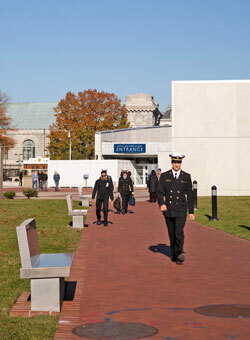 The Naval Academy Visitor Center is open 9am-5pm, March-December, and 9am-4pm January-February. It is closed Thanksgiving, Christmas and New Year’s Day. Guided walking tours depart from the Visitor Center daily. Visit the Naval Academy website for tour times and fees. The Center is located inside Gate 1 (Prince George & King George Street entrances), next to City Dock. Visitors 16 and older must show a photo ID. Only vehicles with DoD stickers and handicapped tags are permitted on the grounds. For more information, call 410-293-8687 or go online to www.navyonline.com. At Bancroft Hall, one of the largest dormitories in the world, all the midshipmen sit down together for a meal once a day. You may be able to catch the noon meal formation in Tecumseh Court, where the entire brigade assembles and marches into lunch during the school year. The Navy Chapel features Tiffany stained glass windows. Revolutionary War hero John Paul Jones is buried in a crypt beneath the chapel. The Naval Academy Museum features some of the nation’s earliest battle flags, the table on which the agreement was signed for Japan’s surrender at the end of World War II, and a collection of model ships considered to be the finest in the world. Sailing is a favorite past time for Annapolis area residents. On any given day, visitors can see sailboats of every description on the Chesapeake Bay and surrounding creeks. The Annapolis Yacht Club hosts Wednesday night races on Spa Creek. Wednesday night races are an Annapolis tradition that dates back to the 1950s. A fleet of 150 sailboats in six classes now participate in the race. The Wednesday night races run from May to September. The start takes place at 6:10pm. The finish line is located in front of the Annapolis Yacht Club, which is just past the Spa Creek Bridge. 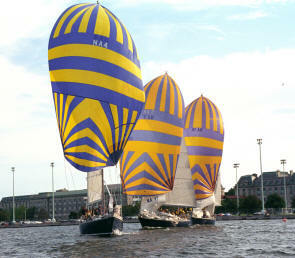 Spectators can view the races from the water by boat, or on land – along the harbor, the Naval Academy seawall, or at the Spa Creek Bridge. The Chesapeake Bay sailing newspaper “Spinsheet,” is a great source for racing in the Annapolis area and elsewhere around the Bay region. Visit Spinsheet’s online edition for up-to-date race information. To really experience Annapolis, you should try to get out on the Chesapeake Bay. The Schooner Woodwind offers 2 hours sails on a 74 foot classic wooden sailing yacht. The Woodwind sails up to four times daily from in front of the Annapolis Waterfront Hotel. The Schooner Liberte sails out of Annapolis in the Spring and Fall. The Liberte offers Sunday brunch cruises every week and is also available for charters. Watermark Cruises offers a variety of 40 and 90 minute narrated cruises which leave from the City Dock daily. For some family fun, try Pirate Adventures of the Chesapeake. If you want to be the captain of your own ship, you can rent a sailboat or powerboat from South River Boat Rentals. Or rent a Duffy Electric Boat from SJ Koch Electric Boast Rentals and Sales. Over in Eastport, you can rent canoes and kayaks from Annapolis Canoe and Kayak.